When you’re depressed or anxious, problems can look bigger than they really are. It’s best to break things down into small steps. This step-by-step approach to problem-solving sets out a new way to overcome the challenges you face. Download our workbook and fill it in, or follow the steps below. The first and most important step is to clearly understand the problem. This is harder than it sounds but is the key to success. Start by writing down the problems you currently face on your worksheet. Then pick out one problem you think you can tackle in the next couple of weeks. Keep it simple the first time, and pick something you have control over. Why is it a problem for you? Use the worksheet to write a short statement that summarises the problem. This will help you focus on it during the next steps. Now you've got one clearly defined problem it's time to look for solutions to resolve it. 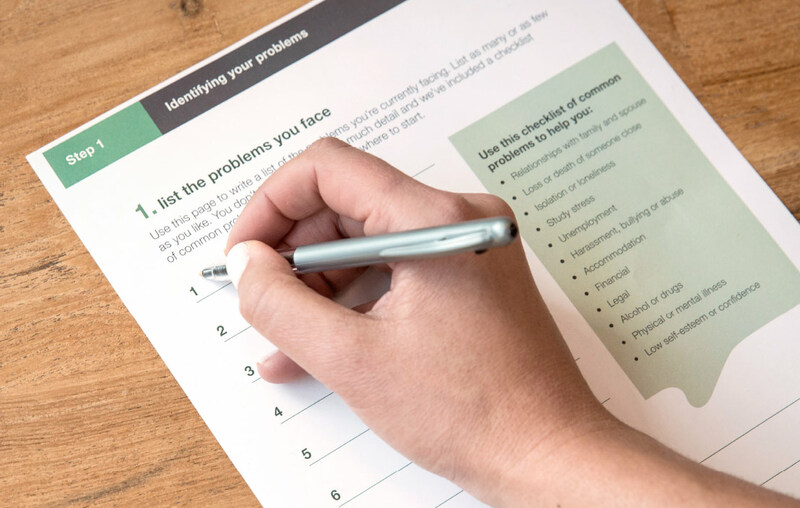 Use the worksheet to list all the ways you might solve your problem. Get creative on the ideas and write them all down, no matter how silly they sound. Don’t try and evaluate them until you've finished making your list. You could call the Depression Helpline 0800 111 757 for help with this. Next pick the solution you think would be most effective. Use your workbook to help you. If you have trouble picking the best solution, try working through a couple of them and comparing the results. What do you need to help you complete your plan? Who can help you? And how can they help you? What is your target date for completing the tasks? How you will know the problem has been fixed? Once you've got your plan it's time to put it into action. When you reach the target date take time to review the plan. What worked? What didn't work? Why did that happen? If you didn't resolve the issue use your review to refine your plan. If you did resolve it, well done! Take some time to celebrate, then start on the next problem on your list! Download the workbook. It will guide you through the steps and let you record your answers.